This wonderfully-light, fresh, and floral fragrance combines the elegant top notes of May Chang with soothing green tea and calming lavender. May Chang has a distinct, lemony scent that is both refreshing and uplifting. Slightly grassy but much sweeter than lemongrass, its addictive scent is reminiscent of traditional candy shops where jars of pastel-coloured sherbet lemons exude this familiar, mouth-watering aroma. More than just an exquisite scent, May Chang energises and promotes mental wellbeing. Lavender—an old familiar friend and perhaps one of the best-known and well-favoured of all fragrances—offers its relaxing properties to this expert blend. An excellent tonic for nerves and anxiety, lavender has been used throughout the years to treat a myriad of conditions, from migraines and headaches to depression and emotional stress. It is often used as a cure for insomnia and has been shown to increase cognitive function. Soothing green tea with its refreshing fragrance adds the perfect balance to this exceptional blend. This pleasant scent has been a popular ingredient in luxury branded perfumes since the nineties—thanks to its alluring fragrance and its ability to soothe the mind. Aside from its calming properties, the aroma of green tea is thought to refresh your emotions and help to stimulate mental alertness. Together, these pure essential oils are expertly combined by our Perfumer for a refined fragrance that will beautifully fragrance your home. 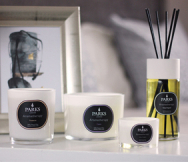 The elegant 250ml black and white diffuser features our iconic branding and comes in stunning presentation packaging—making it an exceptional gift for even the most discerning of recipients.